Main Screen has List View and Detail view. 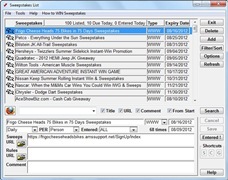 List View is used to browse through Sweepstakes entered and due for entry. When you select sweepstakes in List View, you will get details for it in Detail View. Also from Detail View you can open sweepstakes entry and rules page in browser. In Options Screen you are able to change settings for multiple Sweepstakes List features. Features include Title. 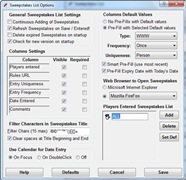 Default Pre-Fill, Pop-Up Calendar, Players List, Default Player Name, Data Cleanup, Columns, Web Browser, other options. Purpose of Filter Screen is to filter sweepstakes in Main Screen List View, view expired sweepstakes, load sweepstakes due for entry only and sort sweepstakes.